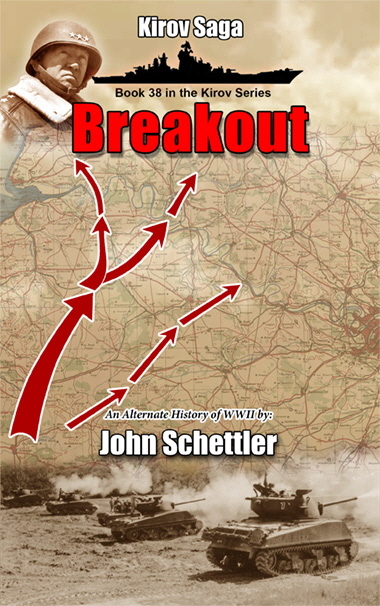 London endures a mass raid by the combined airship fleets of Orenburg and Germany, with a witches’ brew of deadly new weapons to avenge the firebombing of Hamburg. Patton and Bradley supercharge Operation Thunder with a massive bombardment to break the German line, and all hell break loose on the Western Front. Desperate to save the 7th Army, von Rundstedt and Guderian order a withdrawal to the Seine, and the race is on as Patton drives for a bridgehead at Rouen. When the battle heats up, the US Armored Captains are stunned by the arrival of a deadly new German heavy tank, and a brigade that moves like lightning in the storm of fire and steel. As the Allies drive to stop the German V-1s in the Pas-de-Calais, a sudden breakthrough opens to gateway to one of Europe’s largest deep water ports, Antwerp. A daring plan is now devised to seize the port with thunderclap surprise. Meanwhile, Fedorov and Karpov are storm hunting when they have a chance encounter with an old enemy in the skies over the Norwegian Sea. Now they strive to stop a deadly enemy attack on the eastern seaboard, and prevent the imminent destruction of New York.